The 2012 ICF Canoe Slalom World Cup is currently underway and will conclude on Sunday, September 2 when new champions are crowned in each discipline. To watch the ICF Canoe Slalom World Cup Final live online for free, just visit FreeCast. From there, you can click on our Live Events page to find free live streaming coverage of the 2012 Canoe Slalom World Cup Final and all sorts of other live sporting events. The International Canoe Federation has been putting on the Canoe Slalom World Cup (annual series of races) since 1988. There are four canoe and kayak disciplines for men and women. The men’s disciplines are the single canoe (C1), the double canoe (C2) and kayak (K1). The women also compete in the kayak (K1) discipline and the single canoe (C1) discipline, which was added to the ICF Canoe Slalom World Cup in 2010. 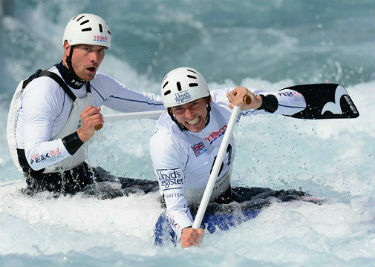 The 2012 ICF Canoe Slalom World Cup Final is held in Bratislava, Slovakia and is streaming live online. Slovakia has had a great deal of success in the Canoe Slalom World Cup over the years, taking home the men’s C2 title in each of the last six years and the women’s K1 title in each of the last three years. Watch the Canoe Slalom World Cup online live for free to see if they will continue to dominate in those disciplines. The reigning ICF Canoe Slalom World Cup champions are Stanislav Jezek for men’s C1, Pavol/Peter Hochschorner for men’s C2, Peter Kauzer for men’s K1 and Jana Dukatov and Rosalyn Lawrence for women’s K1 and C1, respectively. Watch the ICF Canoe Slalom World Cup Final live online for free to see if any of these competitors can repeat in 2012. Heats for the 2012 ICF Canoe Slalom World Cup Final are taking place on Friday, followed by the semifinals for men’s K1 and C1 and women’s C1 on Saturday and semifinals for men’s C2 and women’s K1 on Sunday. Watch all of the Canoe Slalom World Cup action live online with FreeCast from Friday – Sunday. Free live streaming coverage of the 2012 Canoe Slalom World Cup Final will begin at 6am ET on Saturday and Sunday. If you consider yourself a big canoe/kayak fan, be sure to watch the Canoe Slalom World Cup Final online live with FreeCast. You can even watch the ICF Canoe Slalom World Cup Final live online for free with your tablet or mobile device.